Besides, this moment will give me another opportunity to direct your attention to a talented Russian melodic death collective Arcanum Sanctum. Vadim Nalivaiko and company have decided to prove me wrong in some aspects, by broadening out their palette, but also remained consistent in some of their principles. Sticking to their Latin album titles guns, the newest output is called Veritas Odium Paritand since Latin is in vogue with Arcanum Sanctum, I suppose I could quote Cicero for them. Arcanum Sanctum definitely agree with the Roman philosopher that brevity is sister of talent. One more time they delivered a quick, single breath of energy, album, jamming six short full cuts and a pair of instrumentals in just over 30 min. Short, however, does not mean skimpy with Arcanum Sanctum, since their songs may be brief in length, but they are definitely not short on ideas. Proving me wrong, as I said above, the band have partially shed of the image I had in mind for them, that of early Children of Bodom, as the new material on Veritas Odium Parit reminds me a lot more of earlier days Swedish melodic death, with various accents and emphasis points. The Explorer begins in a tech deathy mode and Beware the Dreamer also packs technicality with its syncopated rhythms. Arcanum Sanctum riffs never stand still. They squirm, shift octaves, and maintain restlessness in forever seeking a path out (The Explorer, When Truth and Knife Unite). As much as Veritas Odium Paritmay be short, it actually has a range. Strong riffs of When Truth and Knife Unite and collage of melodies in the chorus of Beware the Dreamer bring to mind Dark Tranquillity of the Damage Done period. When Truth and Knife Unite only makes a brief keyboard appearance, while The Last Drops of Sanity blends keys full on, pairing them up with hefty double bass, but keeping that romantic pang of sadness. With gurgles added to Vadim’s vomitous but legible vocals The Last Drops of Sanity actually reminds of the little known gem Lothlorien, the band I hold in the highest esteem even though they only have one album to their credit. 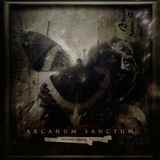 After the brief romantic moment of The Last Drops of Sanity, Arcanum Sanctum is back to its thrashy, blackened, and most devastating, at least on Veritas Odium Parit, ways with From Misery to Purpose. A pair of instrumentals, Rain Imprints, which builds up from piano/bass interplay to synth to full-bodied heavy stuff and a bluesy solo, or In Memory Of…, which stays piano throughout, shows that Arcanum Sanctum members must have gone to music school, or perhaps had some formal music education. Involved and talented, at the same time Arcanum Sanctum, regardless of the direction their songs take on Veritas Odium Paritremain exuberant and hooky. Not copying anybody in particular, they can appeal to melodic death metal of many walks of life, those of the aforementioned Children of Bodom and Dark Tranquillity, but also those who remember of Callenish Circle, Beyond the Embrace or Sacrilege.